This approximates the tableland section of The Fry and Jefferson Map edition of 1755. Joshua Fry and Peter Jefferson (father of Thomas Jefferson) were surveyors. They set the Fairfax Stone in 1746. Joshua Fry was among the first employed by the Ohio Company; was active in French and Indian War until his untimely death. 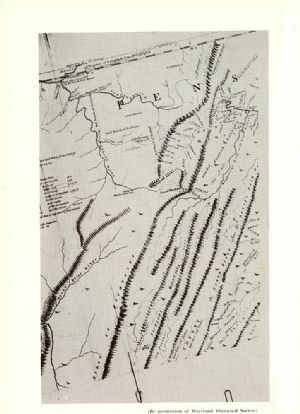 Earlier maps of this area were "Map of The British Empire in America" 1733 by Henry Popple, and "A Plan of The Upper Part of Potomack River" 1736 by Benjamin Winslow, the first surveyor to establish the position of the Fairfax Stone. Of these maps the Fry and Jefferson has been accepted as the standard authority for this early period. It was published in London, England. This is a reprint from one of the original copies now in the possession of The Maryland Historical Society.